Ugly, evil face, with eyes that reflect the devil - that was the impression of Surpanakha I expected to see on the cover. However, the dusky beauty displaying innocence in her eyes made her seem anyone but Surpanakha. Perhaps her long, devilish nails were the only sign of her identity. 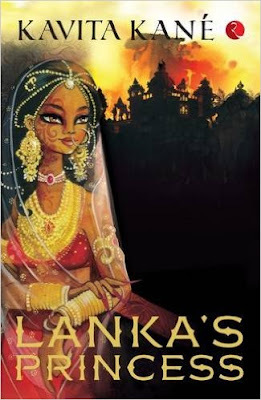 My focus quickly shifted to the burning golden city of Lanka in the backdrop. Clearly, the book had a vey strong story to tell and I just couldn't contain my curiosity! Ramayana is one epic we have all grown up on. While the story reinforced in our minds revolves around the Ayodhya princes, their wives, the war and of course, the mighty Ravan, we fail to notice one character without whom perhaps the story would have been different. That character is Surpanakha, Ravan's sister and the root cause behind the war between Ram and Ravan. The very mention of Surpanakha reminds us of the asura lady who, attracted by Ram and Laxman proposed them marriage. However, upon facing rejection when she attempted to attack Sita, Laxman cut her nose and ears with his sword. An injured Surpanakha rushed to her brother and not only did she complain to him about the two brothers, but also manipulated the incident to describe how the two brothers disrespected Ravan's status and how beautiful Sita was. Agitated, the short tempered Ravan decided to teach the trio a lesson, and the rest we know is history. While we all conveniently shift focus to the others characters hereon, we never bother about who Surpanakha was and why did she instigate her own brother when she very well knew the outcome won't be a pleasant one. Well, it is here that the book attempts to answer many questions about Surpanakha. It is a very different version of Ramayana than the ones we all know, one from the eyes of Surpanakha, who always got overshadowed by her powerful brothers, particularly Ravan. The story has a wonderful prologue wherein one is surprised to know that Surpanakha was reborn as Kubja and Lord Krishna himself lands up at her door to release her of her suffering. The story then rushes into flashback unraveling aspects of Surpanakha's life that we never cared about before. The story underscores the fact that an evil mind is not born. Sometimes, circumstances cruelly bring the worst out of a person. Sadly, Surpanakha was such a victim of neglect and deceit. Born to Rishi Vishrava and Kaikesi as Meenakshi, Surpanakha was just like any ordinary girl with dreams, hopes, desires and affection. However, the goodness inside her falls prey to neglect by her own family. Overshadowed by Ravan, she struggles for her parents' attention, but gets nothing but rejection. Her feelings are trampled by her mother's ambitions. The only people who she finds solace in are her maternal grandparents however, unfortunately they end up misguiding her more than doing good. She finally finds the love she had been looking for in the Kalkeya prince Vidyuvijaya. Just when life seems perfect, tragedy strikes her. Enraged by the death of her husband and son, Surpanakha decides to take revenge for her loss from her very own brother Ravan and eventually becomes responsible for his doom. At times, one feels sympathetic for her pain as she suffers for no fault of hers; while at times, one hates her for her wickedness and wonders how can someone be so blinded and manipulative to meet one's selfish interests. Throughout the story, one gets to see various shades of Surpanakha's personality - compassionate, rebellious, revengeful, dejected, guilty and forgiving. I feel the book is a lesson to all parents that neglect and undue criticism can turn even the best of child to the worst person. Overall, a well researched and beautifully penned book which you just can't miss! Mythology is not an easy genre, considering one has to consider the religious sentiments of masses and there is no scope to play around with the facts. However, the author does full justice to the story and proves that mythology is indeed her forte. Impressed by her attention to details and sensitivity in narration, I am enticed to read her other books. Powerful narration. In no time, one starts imagining herself in the era of Pushpak Vimans and rishis. The book is available at Flipkart and Amazon. received a copy from Writersmelon in exchange for an honest and unbiased review. Need to read this book! Opened my eyes about Suparnakha. Precise and eloquent review. Keep it up! Very well written. Precise and eloquent. I have to read this book now! Need to know Suparnakha! Couldn’t imagine her to be compassionate!